Bernard Kelaher’s headstone, Rue-David Military Cemetery, France. Bernard Augustine Kelaher was born in Bathurst in 1890. He was the eighth of nine children born to James Richard Kelaher and his wife Margaret. Bernard also had an older step-brother and step-sister from his father’s first marriage in 1870. James’ first wife, Mary, had died giving birth to their second child in 1875. Following her death the Bishop of Bathurst sent Margaret Walsh from St. Joseph’s Mount Convent to assist the widower with the two young children. Margaret and James were married the following year. Bernard’s father was a storekeeper in Bathurst during the 1870s and 1880s. In 1886 he owned Kelaher and Eviston Clothiers in William St, and by 1909 was the proprietor of the Edinboro Castle Hotel, also in William Street. Bernard’s uncle was the solicitor and politician Richard Meagher, President of the Australian Labor Party in 1914-1915, and who, the following year, was elected as the first Labor Lord Mayor of Sydney. Bernard was educated at Patrician Brothers’ School and St Stanislaus’ College in Bathurst. He was a keen cricketer and was well-known in the area as an accomplished batsman. In February 1905 he undertook a telegraph examination and qualified for the position of telegraph messenger. By 1915 Bernard – or ‘Bun’ as he had become known – was living in Orange and learning the art of tailor’s cutter from his brother-in-law, Charles Curran. Bernard boarded at Dover House in Anson Street with his good friend, Orange Deputy Town Clerk, Herbert Rockliff. The pair enlisted together on 1 February 1915 and proceeded to Liverpool camp. Bernard returned to Orange in April to farewell his friends and family prior to embarkation. The Orange Handball Club, of which Bernard was Secretary, gathered at the Carrington Club Hotel to wish him well, presenting him with a purse of sovereigns and a gold fountain pen. A Turkish aeroplane flew over our lines yesterday and dropped a bomb containing a type written note, saying if we wished to surrender they would be only too pleased to have us, and that we would be treated well, and they would give us plenty of rum. In early August he sent a “postcard” to his sister Kathie. Complaining that writing paper in short supply Bun had utilised the cardboard from a Turkish cartridge box. Whilst on guard duty in a communications trench at Lone Pine Bernard sustained a serious gunshot wound to the left shoulder and neck. He was transferred to No. 1 Australian General Hospital in Heliopolis, where his wound was operated on and tetanus anti-serum administered. Bun, however, subsequently developed tetanus and doctors recommended he return to Australia to convalesce. When Bun returned to Orange in December 1915 he was given a rousing reception at the Railway Station, despite inclement weather and the fact that his train was over two hours late. The Town Band played Home Sweet Home followed by God Save The King. The Mayor, ET McNeilly, officially welcomed the young soldier home and the band then played For He’s A Jolly Good Fellow. In March 1916 Private Kelaher was declared fit for duty; he re-embarked the following month joining the 14th Training Battalion at Tel-el-Kebir in May. Three months later he was assigned to the 14th Australian Machine Gun Company in France. Late in the evening of 26 September Bun was returning to camp after a night out when a sentry ordered him to stop and state his name. Bun failed to stop, and being the jokester that he was, replied in a foreign language. As Bun moved off the sentry fired two shots in quick succession, hitting Kelaher in the abdomen and the left arm. Kelaher died en route to hospital. A Court of Inquiry the following day determined that that Private Kelaher’s death had been accidental. Bernard is commemorated on St Joseph’s Church Orange Honour Roll and on the World War I Roll of Honour on the southern face of the Orange Cenotaph. In November 1916 Mr and Mrs Charles Curran presented a sanctuary lamp to St Joseph’s Church in memory of Private Kelaher. The lamp also contained a roll of honour of local Catholic boys who enlisted. In 1923 the Anzac Memorial Avenue of trees was planted along Bathurst Road to commemorate fallen WWI soldiers. A tree was planted in honour of “Pte BA Kelaher”; it was donated by his brother-in-law, Charles Curran. Very few of the trees are still standing today. 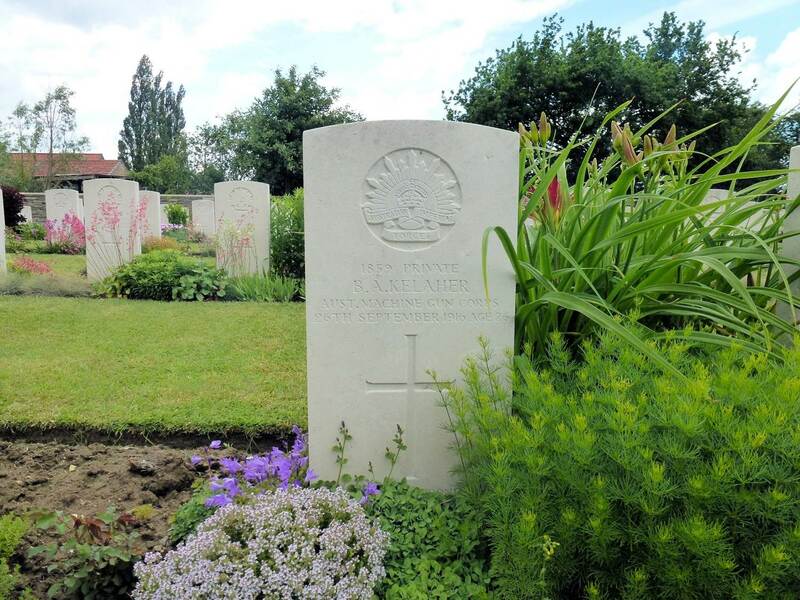 Bernard’s brother – James Joseph Kelaher – also served in WWI; he was killed in action at Gallipoli in August 1915. Bernard’s friend Herbert Rockliff did not survive the war either; he was killed in action in France in July 1916. Leader, 25 October 1916, p. 6. This entry was posted on February 1st, 2015.